The catalog is your main access point to locate physical materials found within the library, as well as eBooks and eAudiobooks. Print books, eBooks, print journals, DVDs, audiobooks, and government publications can all be found by conducting a keyword, author, title, or subject search in the catalog. You may also find Internet resources in the catalog. Click here to access IRSC's online library catalog. The catalog search will look for words in the title, abstract, major subject headings, and (sometimes) tables of content. When searching the catalog, it is important to remember that you are not searching the full text of these items. For this reason, you will get a much smaller, but more precise, return on a search than you would in a database or Internet search. If you have a very narrow search term, you will need to use broader terms to find materials on the subject. IRSC can borrow many different titles from other libraries. If you have a specific title you want, you can search for it using the IRSC full catalog by changing the At search to All 28 Colleges. If you find the title there, click on the college name at the bottom of the record and then click 'Request' to request the book from that college. If you are looking for a specific article or book not found in the catalog, use the Request an Item form below to borrow the material from another library. Request journal or magazine articles not available in full-text format from the IRSC databases. Or request a book or DVD not owned by any of the IRSC libraries. Prefer to listen to a book rather than read it? Long commute? You can download Digital Audiobooks from the IRSC Libraries' databases. 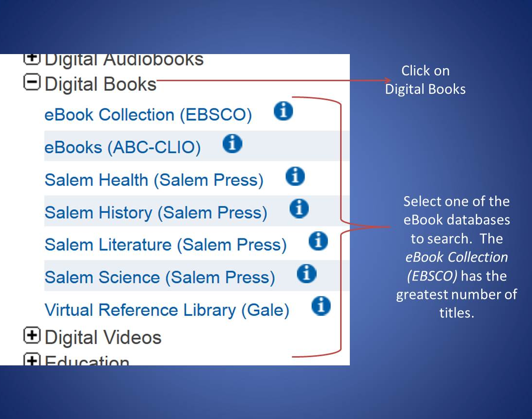 We have streaming audiobook titles in the Audiobooks (EBSCO) database and the OneClickDigital database. Find them in the database list under "Digital Audiobooks" or click the logo to sign in and start searching now.